I’ll admit it, I’m a latecomer to the whole photography game. I minored in it during college, but that ended up being a few classes using only black and white film cameras, darkroom fundamentals, film developing, and a dab of portrait basics. When it was all said and done, I knew more about taking negatives and turning them into full 8 x 10 photos than about how to actually take a good photo to begin with. Like a lot of other things, photography is one of those areas where real-world practice is the key to improvement. In the last three years, I’ve learned infinitely more about the subject through my own research and experimentation than I ever could in a classroom. I never dabbled with promotion in my college days, and it wasn’t even a subject we discussed. But today, it’s easier than ever to put your photos in front of a vast audience by including them on some of the photo sharing websites we’ll discuss below. For me, this is the most important site on this list. Flickr doesn’t excel at one particular thing, but performs very well for certain functions, and throws in other features that make it that much more attractive. 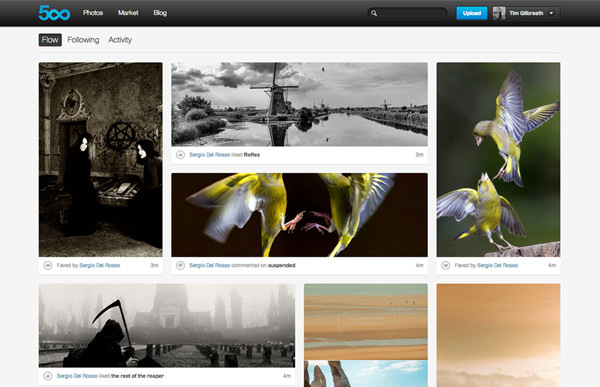 Flickr’s greatest strength is its community. Thousands of other photographers and enthusiasts reside here, forming into groups and sharing their work with each other. You can submit any of your photos to these groups, which feature message boards as well as photo feeds, and are a great way to get exposure. The vast majority of comments and “likes” on my photos have happened on Flickr. Flickr’s greatest strength is its community. Flickr Pro is a great option at only $24.95 per year, and gives you the ability to upload unlimited photos, removes advertisements, and allows you to store full-size, high resolution copies of your work; this turns Flickr into a backup and storage service, and this alone is the worth the price to me. The only drawback that I’ve experienced with the service is the photo quality; after uploading shots to the site, a downsizing and compression process occur to prepare the photos for viewing, and it’s fairly apparent that this has happened when you compare the photos to other sites, such as 500px. Everything about 500px says “high quality”. From the layout and design of the site itself to the actual content, 500px invokes a different feeling than other sites. Geared towards upper tier photography, the service allows you to upload a portfolio of images, but also implements a rating system, with a single accumulative number of “affection”. The more likes, favorites, and comments you get, the higher your affection will be. 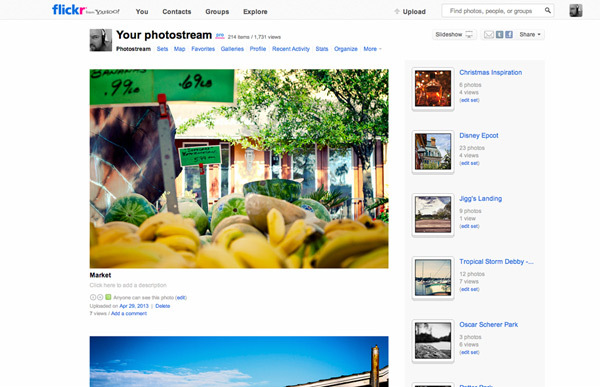 What I like about 500px is the fact that it forces you to think about what you’re sharing. Snapshots and family picnic photos don’t fit here. Several high-profile and well-known photographers have accounts here, and the quality of the content trickles down. Galleries you put together are extremely well done, and look nice and clean, without the intrusive ads you normally see at other sites. Upgrading to the first Pro level is only $19.99 per year, and well worth it; on the free account, you’re limited to only 10 uploads per week, and you won’t have access to statistics. At that rate, it could take a very long time to get your entire collection uploaded. Some people in the photo community tend to look down upon the “voting” method of exposure on a site, but it’s hard to deny the quality 500px brings to the table. Seriously, Facebook? Yes, Facebook. While a portion of the photo community forgoes social media altogether (and I can’t say I blame them necessarily), it’s hard to ignore the exposure Facebook, Twitter, and other similar sites can provide. For those who shy away from such services, the positive point is that you can keep your personal posts and photography somewhat separate through the use of pages. A page can be created (based on “likes” as opposed to “friends”) where your photography can be displayed, posts can be created, and interactions with your fans is encouraged. This page can be associated with your personal Facebook account, so that you’re able to administer the page within your existing setup. Gathering admirers of your work has never been easier! The obvious advantage is social networking and exposure; anyone who likes your page becomes the equivalent of a friend, and will see your updates in their news feed; tons of statistical data such as insights allow you to see how many people are talking about your work. Widgets on almost every major blog package allow your readers to like your page, and instantly become a follower. Gathering admirers of your work has never been easier! The only drawback to DeviantArt is that you might not know it’s a place to get exposure for your photography. DeviantArt caters more to artists in general than to photographers in particular, but that shouldn’t stop you from taking a look. There is a great community on the site, and it’s easy for comments and favorites to rack up quickly when you’re putting good quality photos there. Just know that even though all content is well-categorized, you’re competing with drawings, paintings and sculpture as well. Like most sites in this category, DeviantArt allows you to upload, categorize, and promote your shots through groups or journals, which are more or less blog entries that your friends and followers can view. The site also lets you add photos as prints for sale, and includes a system to manage the financial aspect of these transactions. Like Flickr, the interaction here is hectic, and feels more like a down-home community than a more “stiff” sense of interaction such as is the case with 500px. DeviantArt is a complete artist’s community online. But with this looser feel, you also get a downturn on quality. You won’t be browsing long before you stop and think, “Why is that even on here?” This is not to say that there isn’t great content on the site, the implied standards are just not as strict as you’d expect with a 500px or even Flickr. Snapshots, family photos, and even some bad “photographic nudes” are common here. Luckily, you can turn off any adult content with a checkbox in your account settings. Ahh, Pinterest. The up and coming underdog of the photography world. 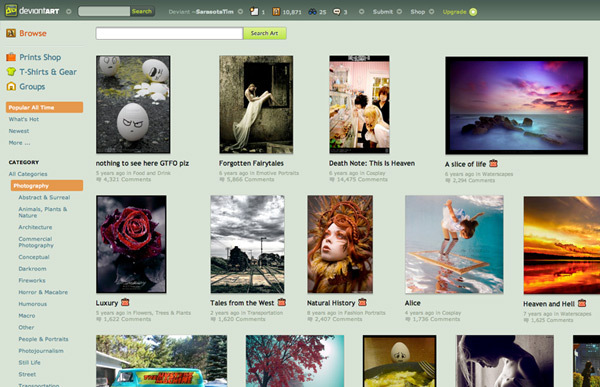 Like DeviantArt, Pinterest wasn’t intended to be a photography site first and foremost. The site allows you to collect bits and pieces of content from around the web, whether it be text, articles, or images, and “pin” them to various walls you set up on your account. We’ve probably all heard the notion that the site is only being used by ladies looking to take notes on a collection of shoes they’re coveting or recipes they’ve been hoarding (and yes, you will see plenty of that), but since practically anything can be pinned, it makes for a great area to show off your photography. Pinterest has always given me consistently good results. 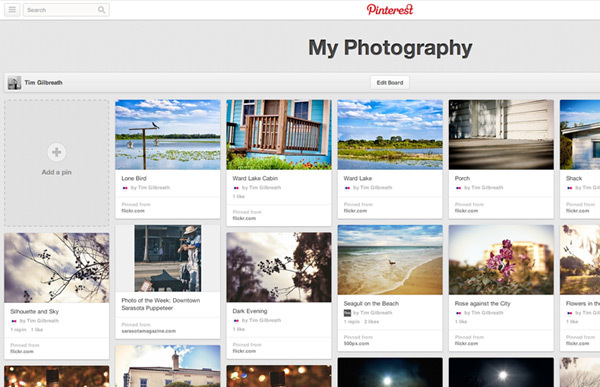 If you’ve ever seen the small red “Pin It” buttons around the web, you’ve seen how Pinterest works; different boards can be created for different categories, such as Photography, Things I Want, My Styles, and so on. 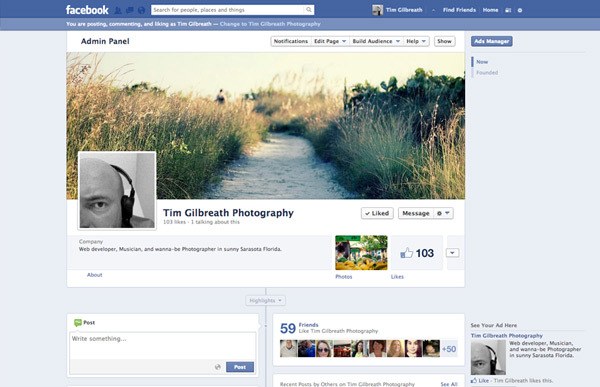 Since it’s a social network, you can collect followers for your photography, and follow other people as well. I’ve had good results using the site, and almost always have at least a few users pin my work to their various boards when I share it. Fotoblur shares a few similarities in regards to look and feel with the giant of a website that is 500px, as well as the use of the familiar rating system, here called “promotions”. Fotoblur also has a minimalist user interface and promotes higher quality photos. Fotoblur greets you with a clean, clutter-free interface. Some may find the free basic account a bit too limiting, since you’re restricted to 30 images total in your gallery, and are also limited in how many images you can upload per week. The premium upgrade removes all of these restrictions, as well as ads, and adds in a nice statistics package. Fotoblur maintains a fairly large and active membership, making it a useful place to showcase your shots and mingle with other photographers. Ok, first Facebook, now Twitter? This is just crazy talk, you say. But there’s no denying the fact that social media has become a mover and shaker in the world of promotion, especially in areas like photography where digital media are being advertised. Twitter wasn’t initially designed around the use of images, but it excels at spreading the word about those images, raising awareness of your work. Like Facebook, Twitter allows you to maintain a base of followers, to which you can upload images and links anytime you’d like. The information is sent in a text-based format, and is limited to 140 characters, which makes the updates to your followers speedy and instantaneous. Twitter’s user base is absolutely enormous, with over 500 million registered users as of 2012. This means your audience is virtually unlimited. Although the site isn’t your best choice for graphically displaying your work, its huge user base, quick updates, and low price (free) makes it a necessary supporting addition to any photographer’s promotional resource list. Like Facebook and Twitter, Instagram is best used in a supporting role. Launched in 2010 and recently purchased by Facebook, Instagram was initially a mobile-only service, allowing users to upload, modify and share photos with other users. Instagram’s draw was the set of retro and vintage filters available for use. Users could either take photos with their smartphone, or upload their DSLR shots, choose a filter, and make the photo available to their followers. 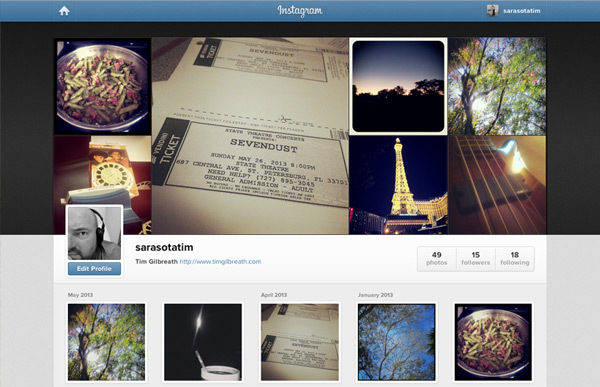 In 2013, Instagram introduce web profiles, allowing users to browse people’s work within a web browser. 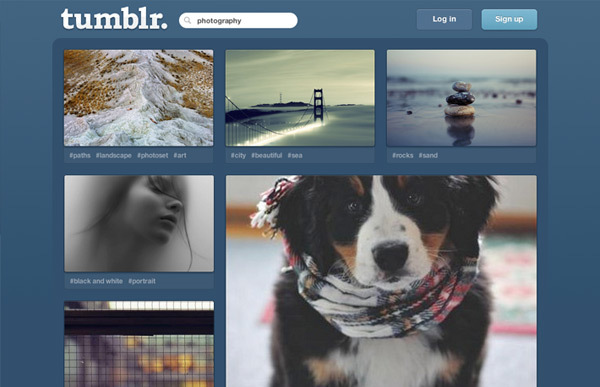 Tumblr is a bit of a strange beast, since it doesn’t really fall into a nice, neat category as a website. 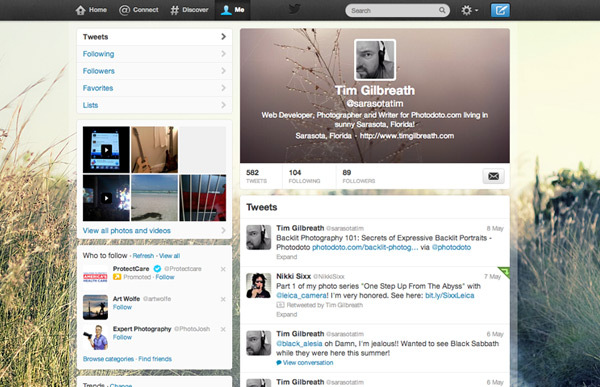 It’s a bit of WordPress, Twitter, and Flickr all rolled into one. Defined as a microblog (although much more robust than Twitter), Tumblr allows you to instantly create a presence online and share images, text, audio, video and links to other sites. As with most of the sites on this list, Tumblr comes with a built-in audience of other bloggers, any of which can “like” your articles or photos, and follow you in their content reader. 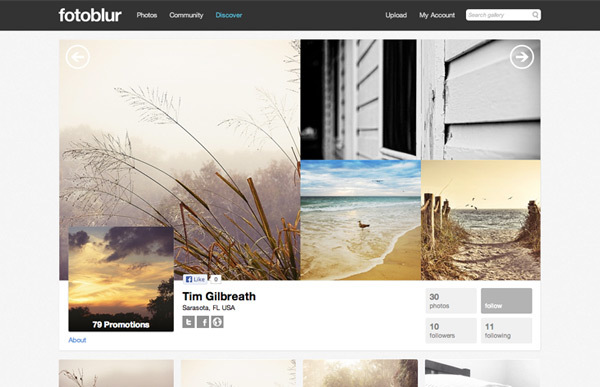 WordPress, Twitter, and Flickr all rolled into one! The service has grown to be extremely popular, and is available on the web as well across most of the common smartphones and tables through their respective apps. Tumblr tends to be a niche service however, and you’d be hard pressed to find a well-known photographer use it as their primary means of promotion. 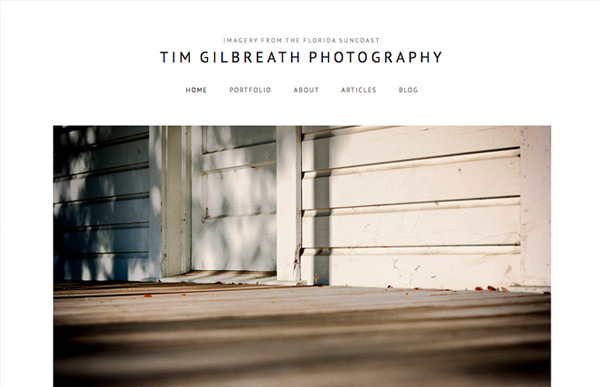 It’s fun, fast, clean, and simple…a great compliment to a solid online presence for your photography. 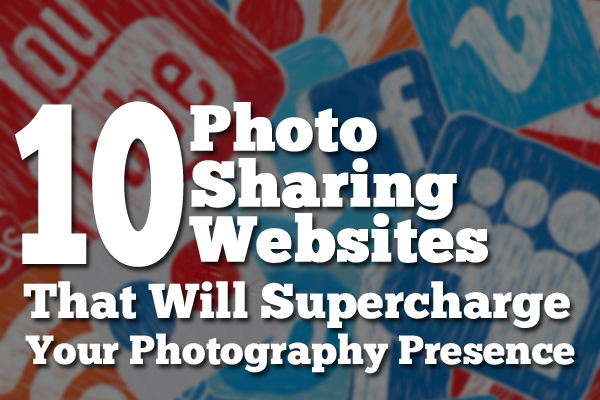 Finally, I’ll close this list with possibly the most important site for a photographer to maintain…their own. While most professionals (as well as hobbyists) maintain a presence on the social networks, almost all have a standard website of their own as their base of operations. Some people prefer portfolios, forgoing much text content, while others use a hybrid portfolio/blog approach. Both have their own strengths and weaknesses, such as domain name use, search engine optimization, and security, and both can be created through several different means. Maintaining your own personal site means that you won’t have any issues with using your own domain name (most online photo sharing services require a premium membership plan in order to use a custom domain name), and it also means that you are in complete control of everything; no limits on what you can use or how much hard drive space you are allowed to take up (with the exception of your host’s limitations, of course). Having your own dedicated website gives you more control over your content than any other option. You have several methods of creating the site at your disposal, from content management systems to standard HTML and CSS. The sky is the limit! Perhaps one of the easiest way to set up a photography website is via WordPress. There are tons of free and premium themes available and you can actually create a WordPress blog in less than 20 minutes. We also have an informative article about building a photography website here. Pricing varies with maintaining your own site; domain name registration, monthly hosting costs, and WordPress/Joomla templates are all variables in cost. So there you have it, my friends. A short list, to be sure, but a good start nonetheless. There are countless other outlets to showcase your work, but the better method would be to concentrate your efforts on 4 or 5 of the most popular that will work for you. Otherwise you’ll run the risk of spending more time managing your online presence than you will actually taking photos. This is easy to do due to the amount of work involved in keeping your latest shots synced across all of your social avenues. 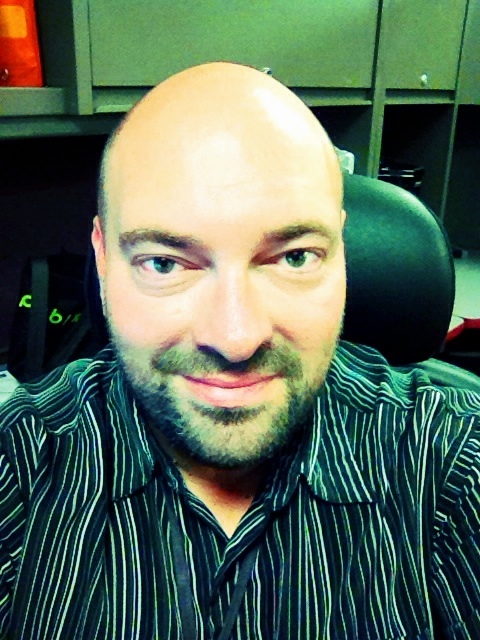 Have recommendations for other photo sharing sites or services you can’t live without? Enlighten us by leaving a comment below! If you need more social media coverage, take a moment to check out How to Make Instagram Filters in Photoshop: Earlybird and 50 Striking Examples Of Professional Photos In Twitter Background Design.